Tucked away in a box of old books, it looked just like a modern notebook, size 16cm x 10 cm, a black cover, thin, but then I realised it was a book. I was amazed to read the title page, Fig 1. A poem about Birmingham? 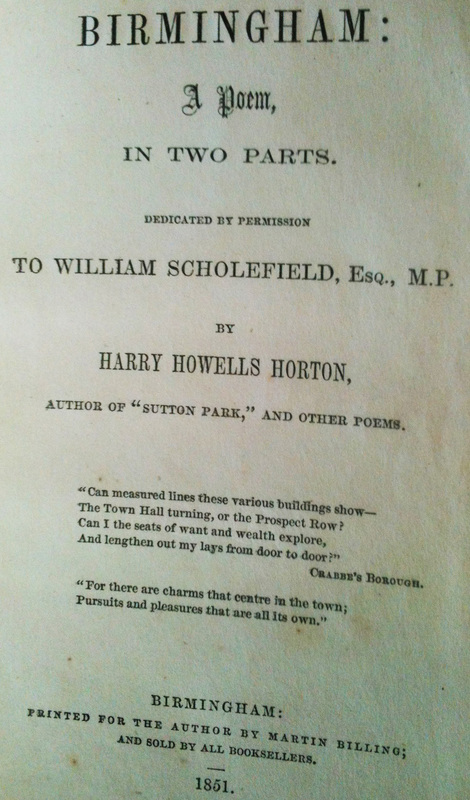 Yes, in two parts, in rhyming couplets, a total of 100 pages, dated 1851, and written by Harry Howells Horton, dedicated to William Scholefield M.P., Fig2. There is a note in the preface which states “The Author had prepared a brief historical sketch of the town, which he intended to have introduced here, but he finds there will not be room-at least in this edition.” A search for this book reveals that there was a second edition, with an appendix, dated 1853. 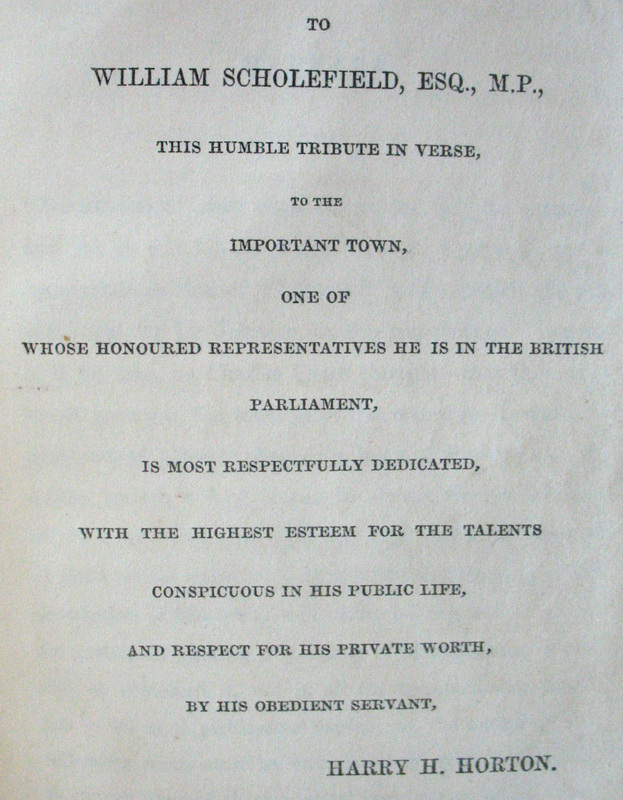 Copies of this edition appear to be readily available, but not the first, 1851, edition. It is beginning to look as though this is a first edition and that it might be relatively rare! It long has been our pride and our delight”. Under the parochial system of governance the established church had been able to impose a levy on households in the town to cover mainly the costs for the overseeing of the poor but also the cost of upkeep of the churches, and known as the church rates. Responsibility for the poor was moved elsewhere but the rates continued. This was not popular and there was trouble, as described by the Poet. Against their pious foes at last engaged. They called the plunder which she called the rate. Suffered, but conquered, in the cause of right. George Muntz was a highly successful metal-roller, who invented a type of brass called Muntz metal. He was extremely eccentric and very aggressive and in 1837 he led a minor riot in a vestry meeting in St Martin’s church in protest against church rates. He was convicted on a charge of affray but this was later quashed. Not long after he entered politics and became an MP. This account of the affair also says a lot about the Poet. My final quotation is about the Revd Rann Kennedy, who is said to be “…an eminent classical scholar and a poet of no mean pretensions”. From 1797 to 1817 he was curate of St Paul’s and from then until 1848 he was the incumbent, his congregation having purchased the presentation for him. He also became second master at the Free Grammar School, King Edwards, in 1807, where our poet, H. H. Horton, was a pupil. This entry was posted in Birmingham History on April 17, 2015 by John Sawkill.